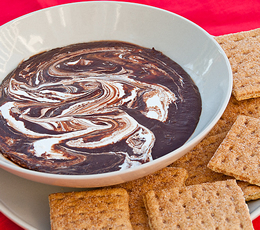 “Get your s’mores on in this fun dippable form!” Thank you Laura with realmomkitchen.com for this simple treat to enjoy with the kids. In a microwave save bowl, add the sweetened condensed milk with the chocolate chips. Place in the microwave and heat for 30 seconds. Stir and heat for another 30 seconds. At this point gift it a stir for about 30 seconds and see if all the chips have melted. If not microwave in 10 second intervals until the chips are melted and the mixture is smooth. Place the mixture in a microwave safe pie plate. Then drop spoonfuls of the marshmallow creme randomly over the chocolate. Place in the microwave for 30 seconds, the cut the mixture with a knife making a marbled look. Serve immediately with graham crackers.